1 – Who develops the best database for my coverwrap campaign? 2 – Are 1:1 campaigns best for acquisition or retention targeting? 3 – What are the best B2B target prospects? 4 – How long is the basic B2B campaign? 5 – How long are public place & point-of-care campaigns? 6 – Can we purchase a single coverwrapped issue of a magazine? 7 – Who develops the creative? Can you help us with creative? 8 – Do you have a creative template to assist our planning? 9 – What if some of our targets already get a subscription? 10 – Can we eliminate any components? 12 – Can we wrap for current subscribers? 13 – Share more about the announcement letter or postcard? 14 – Do you offer any multi-year, or early renewal discounts? 15 – How long do most B2B clients renew campaigns? 16 – How do we pick the magazine that’s best for our target? 17 – Can we talk with clients about their campaign & results? 18 – Can we use a similar creative the entire campaign? 19 – Can we give our recipients a choice of several magazines? 20 – Are there any additional charges we need to anticipate? Audience Innovation uses our in-house expertise to develop the database for each and every campaign created, combined with our sourcing numbers expert database suppliers nationwide, and in some cases, internationally. We also work with some clients who already have their database, and we either augment what’s already given, and/or start from scratch – it’s client/agency choice in these cases. For B2B and affluent-targeted campaigns, client have successfully used magazine cover wraps for both acquisition and/or retention. We’ve done campaigns that are 100% retention, other are 100% acquisition and many are both. Given long-term impact of these very dramatic and hard-hitting campaigns, it’s easy to see how they’d be effective for both targets. If counts are sufficient, and cost is covered, we can do split copy, if needed for most impactful messaging.Audience Innovation uses our in-house expertise to develop the database for each and every campaign created, combined with our sourcing numerous expert database suppliers nationwide, and in some cases internationally. We also work with some clients who already have their database, and we either augment what’s already given, and/or start from scratch – it’s client/agency choice in these cases. Whether you’re targeting 2,000 CFO’s, 5,000 channel targets, or 10,000 distributors, consider the impact is dramatic and proven, and essentially, it’s like attaching your company’s brochure to the outside of a well-known magazine every. The continuity and impact are vibrant, and do the math, as much as 72 pages of impact each and every year, not counting the gesture of goodwill conveyed by the ‘gift’ of the magazine. It’s perfect for both retention and acquisition. Audience Innovation builds campaigns based on client need and objectives. Given that, we offer a greater degree of flexibility with our magazine partners, to which helps us construct the most effective campaign for each scenario. In most cases, B2B campaigns are generally 12 months in length, though we have flexibility to build campaigns that are 6 months in length, and plus single issue call-to-action options. Each scenario varies based on minimums required. 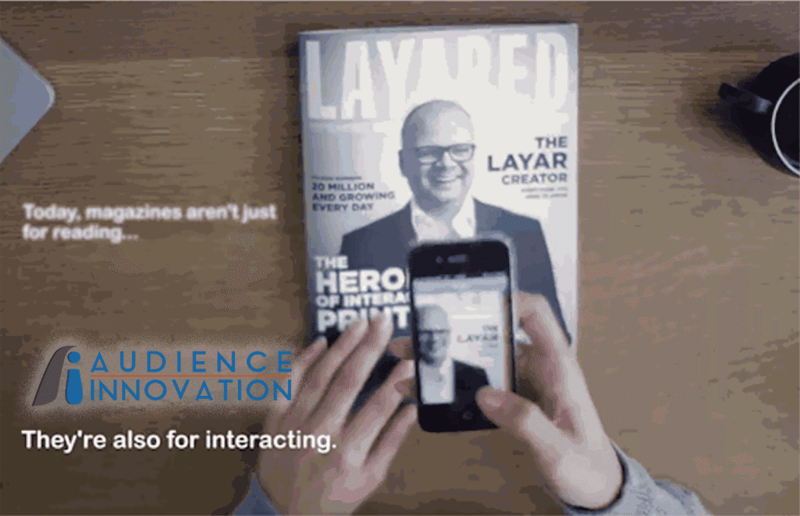 Audience innovation builds campaigns based on client need and objectives. Given that, we offer a greater degree of flexibility with our magazine partners, to which helps us construct the most effective campaign possible for each scenario. In most cases, location-based campaigns are generally 6 months in length, though we have flexibility to build campaigns that are 3 months in length, and in some cases, even a single issue call-to-action. Scenarios vary based on minimum count. Audience Innovation works with client and agency partners to guide the most effective creative messaging possible. In most cases, the client’s agency develops the creative, and of course, we are more than happy to offer guidance and suggestions based on 20+ years experience developing these campaigns. We provide creative development, if needed. Yes and no. Audience Innovation provides a creative guide (and specs) with recommendations for all creative units, so your messaging platform is as effective as possible. This information is not published publicly; it’s shared with client’s request it on a one-to-one basis, depending on what’s needed and the situation to which we’re assisting both client/agency partners. Detailed specs are provided for the magazine/s being utilized, and we cover all ‘what’s needed’ in our Campaign Activation Call at the very beginning. We provide access to the world’s leading magazines, and as a result, some recipients will already have existing subscriptions to the magazine provided. In these cases, the subscription is paused while the ‘gifted’ subscription is in play, the the original subscription resumes when the client’s capping has ended, all handled seamlessly for the recipient. Via this process, we ensure that no recipient is receiving two issues of the same magazine, and provide a call-in # to rectify correction, or any other subscription revision. Yes, though it’s normally recommended as eliminating any individual component of the campaign jeopardizes the success of the effort, a process proven to work extremely well. The campaign is crafted to include an announcement letter and response survey, both of which are integral of campaign’s success. We recommend all elements for these reasons. No, not per se. All campaigns created by Audience Innovation are designed to reach the prospects and/or customers of a company, selected by database filters that provide the most effective targeting possible, and not requiring recipients to already be receiving any given publication. Targeting a magazine’s specific subscribers is offered for in-book advertising, not via cover wrap campaigns. The announcement letter/card is an integral part of the campaign’s success. Your announcement sets the tone for your campaign, letting each recipient know that they’ve been specially chosen to receive this very informative effort, a message from ‘ the CEO of ABC company’, for example. It’s vital component of building the appreciation value of your campaign, a valuable additional touch point that builds long-term connectivity with key constituents, your customers and/or prospects. For B2B campaigns, the announcement is always a 1st class letter mailed on client letterhead to each recipient, which is received about 7-10 days prior to the first issue. It’s timely and impactful, a pleasant ‘announcement’ of your goodwill. For B2C campaigns, the announcement is always a high quality card mailed to each location, received approximately 7-10 days prior to the first issue. It’s timely and impactful, a pleasant ‘announcement’ of your goodwill, and conveys their acceptance of the magazines, and importantly, requesting that the cover wrapped issues be placed in public waiting area.For public place campaigns, the announcement is normally a first class post card, and all other details are similar, so office is notified, and asked to place copies in waiting areas. Yes, both … and we’re committed to serving the long-term needs of our clients, including offering an annual renewal discount, without clauses for up to three years in advance. Many clients choose this option, as it’s a no-loss benefit for them to continue, save money, and if they cancel, there is no penalty or remuneration. We strongly recommend this for our clients. The average client life of our annual B2B campaigns is 7.3 years, and 70% of our clients renew their campaigns every year. The longest continuous campaign was 17 years, an effort that became a pivotal component of that company’s annual plans.We’re happy to share more success stories, and case studies, in a one-on-one meeting. We do protect our client’s confidential information, and as a result, we do not share proprietary information, though anecdotal details are available. Audience Innovation has forged partnerships with nearly every major publisher on the planet, and for those we don’t have relationships, we are constantly adding new titles to our offering for our client and agency partners. We generally don’t offer ‘trade’ magazines for many reasons, and especially, we’ve proven that trade magazines are not effective. To that end, we provide a choice of recommended titles, based on your target, company culture, and of course, based on budget parameters you convey. The selection of the best magazine is conveyed per factors discussed with you. Yes, we have many clients who are more than willing to share their success, as long as it’s not competitive. Please let us know if you’d like to speak with our prior clients; we’re more than happy to arrange a conference call to convey testimonials.  Most of our clients create a template that’s used for the entire campaign, for direct-to-recipeint targets, so the cost is limited, and more importantly, so your recipients immediately recognize the magazine and your message when received. We’re happy to share more to have your campaign most effective and efficient. We’re happy to share more, to keep keep your campaign efficient. For location-targeted campaigns (retail and point-of-care), the creative is often identical, although some clients will use a different front cover image so there’s a rotation in the location, and the magazines have more visibility as a result. This is very common. Yes, though the minimum count must be maintained for each magazine, and an additional 4-6 weeks must be added to the campaign’s start-up, to allow the client/agency to receive and track recipient responses. If a recipient doesn’t respond, they will automatically be assigned one of the choices given, and can’t be switched once they’re assigned to particular magazine. In most cases, unless it’s a large database, this option sounds enticing, though it’s generally more work than benefit. The campaign cost we quote includes all components of the campaign, turn-key, except creative. We include all printing, binding and mailing costs for the entire campaign. We also include standard allocation for database development, so that’s included, unless the database request is extraordinary, and in these cases, it will require additional costs. Additionally, we offer the 4-page cover wrap, and as added value in that we provide you the 6-page gatefold option at no additional charge, for 1,000+ recipient campaigns – it’s normally +$1,500/printing, or $18,000 savings annually.Additionally, we normally survey 10% of your targeted recipient list, and as with gatefolds, we are more than happy to offer 100% survey for campaigns up to 1,000 recipients, as an added value option, also upon request or when offered by your sales rep. Otherwise, you deliver film/digital PDF’s for printing, and all costs are handled from that point forward.